Sometimes, things done just for the sake of curiosity can have interesting applications. 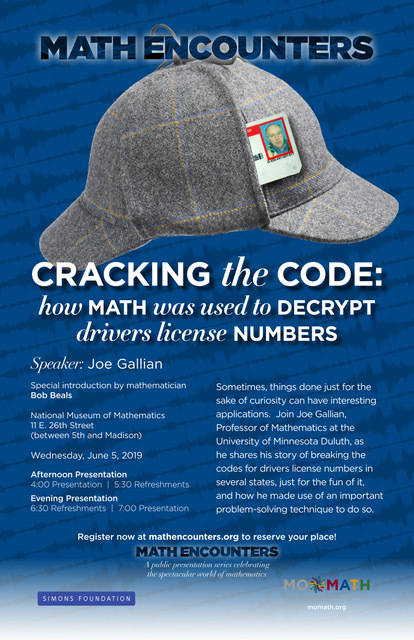 Join Joe Gallian, Professor of Mathematics at the University of Minnesota Duluth, as he shares his story of breaking the codes for drivers license numbers in several states, just for the fun of it, and how he made use of an important problem-solving technique to do so. Special introduction by mathematician Bob Beals. For further information, call the National Museum of Mathematics at 212-542-0566 or e-mail mathencounters@momath.org.